Automotive columnist Eric Peters apparently has less knowledge of personal responsibility than he does of Porsche responses, as demonstrated in his recent column ("Seat Belt Nags Should Lay Off'). He claimed that states should not be making laws requiring belt use, that he has the right to choose his risks. Fine. I will allow Peters the privilege of going unbelted, but with a couple of provisos. First, since I do not want to subsidize his irresponsible behavior, I will insist that he sign away any medical insurance that would pay for rebuilding his shattered body when it is crowbarred out from under the dashboard or removed from an impaling steering column—or, more likely, found some distance from the car , still bearing the ribbon cuts from exiting the car via a shattered window. Perhaps he can afford to pay for his treatment out of his wallet. Still, this may require posting a special bond in order to drive legally. Peters states that failing to wear a belt does not affect others. Oh, yeah? That may be true until he dies in an accident. He should first be sure that he is truly an island. That he has no family or friends that will miss him terribly. That he has no employer who depends on his work, or employees who depend on his guidance and the stability of his company. No parents who would face the greatest kind of loss, that of a child. Or children who depend on him as the anchor in their lives. Is Mr. Peters, truly such an is land? If so, I feel even sorrier for him. The argument that we all take risks and that refusing to wear a belt is like the chances taken in mountain climbing or car racing is a red herring. Yes, we do offer medical coverage for those who choose risky adventures, but these are quite different than refusing to buckle up. I am glad to help subsidize those who climb cliffs or race cars. Pushing the edge of the envelope is a human activity that makes us all richer. Does Mr. Peters really compare his obstinance to the bravery of Sir Edinund Hillary or Dale Earnhardt? C'mon! 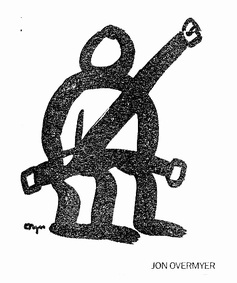 There are NO good arguments for refusing to belt up. Oh, yeah, you may have heard of the rare accident where a belt contributed to injury, or the tiny incidence of fires in auto accidents. But, it is foolish to bet your life on anecdotes instead of the statistically overwhelming odds of survival with belts. Mr. Peters needs to grow up. Or, if he is an island, get a life. And then wear a seat belt to keep it.